At Eastern Heights Elementary School in St. Paul, a vast new space called the Learning Studio is home to personalized learning. 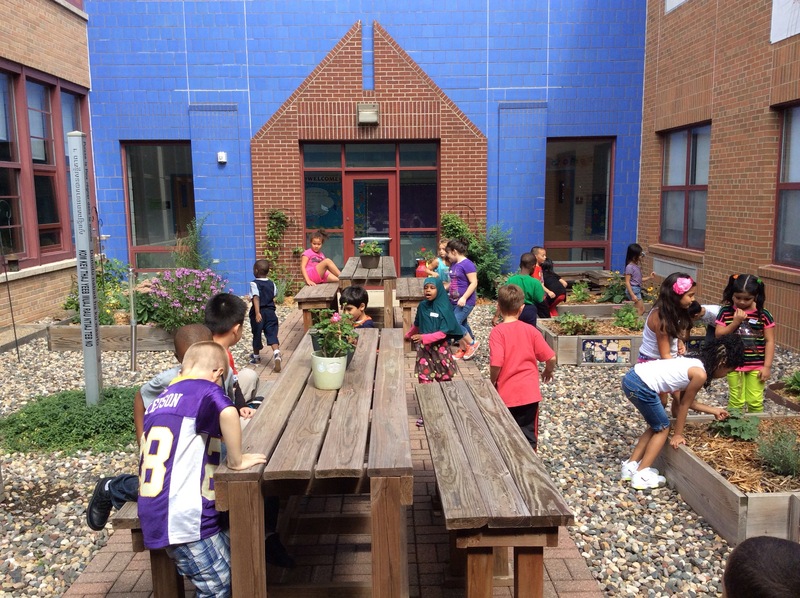 On any given day inside the sprawling Learning Studio at Eastern Heights Elementary School in St. Paul, Minnesota, second graders might be drawing side by side on iPads, poking around in garden beds with veggies and flowers, reading books in quiet corners, or recording videos. A racially and economically diverse school of about 420 students, Eastern Heights Elementary has been emphasizing a teaching method called personalized learning as a way to close the school’s achievement gap. Though definitions vary, personalized learning is generally understood as a way to tailor teaching strategies to meet students’ unique learning needs, cultural backgrounds, and interests. About two-and-a-half years ago, the school began rolling out mobile devices and working with teachers to develop the process. But Eastern Heights Principal Billy Chan and fellow educators felt something was missing—a space that would lend itself to the full potential of personalized and mobile learning. The idea for the Learning Studio was born. After negotiations, the school district agreed to support the idea with furniture, bookshelves, and teacher technology stations. The garden outside the Learning Studio. intervention strategies are based on research conducted by the Minnesota Center of Reading Research. Last summer, teachers and staff transformed the spacious old school library into the Learning Studio. Technology Integration Specialist Marc Patton said the library was filled with outdated books stacked on shelves too high for kids to reach and lacked a media specialist. The teachers weeded out half the books and moved the rest onto mobile shelves. When the school year started, Eastern Heights piloted the Learning Studio with its second-grade class of 75 kids and a team of educators, including an ELL teacher, a special education teacher, and an academic coach. The second graders spend several hours a day in the brightly colored Learning Studio as one large group. Kids wobble around on orange stools with rounded, rubber bottoms. Some use end tables as small forts for reading. Educators use the space to set up learning stations where students can explore curricular concepts depending on their interests and learning styles. One teacher may lead a group activity while another reads to students and another helps them independently solve problems. A panoramic view of the Learning Studio. The school’s personalized learning model draws from Universal Design for Learning (UDL) guidelines developed at Harvard University. The transition from a small classroom to spending more time in a large space with three times as many students was not always easy. Teachers had to rearrange the furniture a few times to get it right. Chan said it was an adjustment for teachers to allow kids more freedom to move around and sit or recline however they were comfortable—like on their bellies. But by the winter, Chan and Patton said, students and teachers developed a trusting relationship about the space and materials. A school survey found the second graders’ level of engagement was higher in the Learning Studio and dipped down when they entered traditional classrooms. Next year, the school plans to incorporate more grade levels and expand the studio with a “wet lab” for paints and science experiments as well as a recording studio. “The data is there to support this and we feel strongly this is the direction we want to continue on,” Chan said.